Regroup your total sales, conversion rate, traffic sources, and so much more in an easy-to-set-up ecommerce report. Your ecommerce strategy is constantly evolving, and it’s important to understand your performance in order to be able to improve and take advantage of opportunities as they crop up. 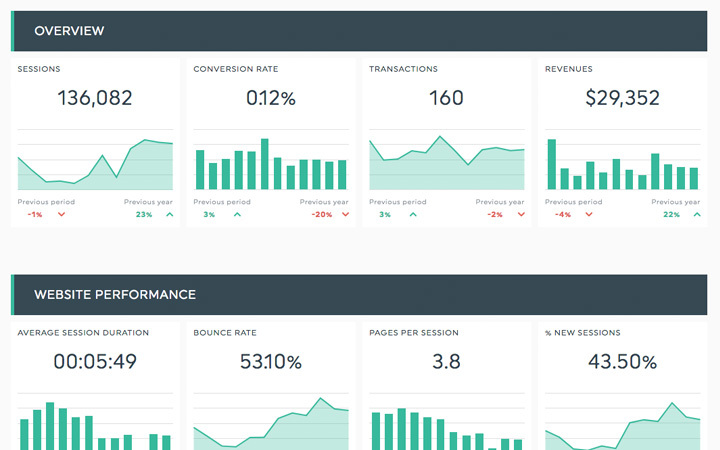 Our ecommerce report template includes all the important KPIs you need to stay on track! Creating your ecommerce reports doesn’t have to be complicated. Our ecommerce report template includes the KPIs you need, such as transactions, conversion rate, average order value, and more! Give an overview of how the business is progressing by using this trend widget, which shows your total number of transactions. Ensure that the business' bottom line is always increasing thanks to this trend widget, which shows the total sale revenue of your transactions. 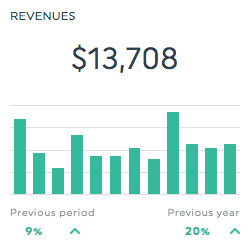 This list widget shows the total revenue from purchased product items; a great way to show a breakdown of which products contribute the most to the total revenue, and which ones might need to be pushed a bit more. This multi-column list widget shows the conversion rate by channel, enabling you to determine where paying clients are coming from, and how your budget should best be allocated. See how your data looks with our preset widgets! Show your results in a beautiful Ecommerce report template! Plugging your own data from across a multitude of tools and web pages into our simple ecommerce report template is as easy as 1-2-3! Include your Google Analytics data with data from a multitude of other tools… all in the same report! Choose the ecommerce report template from the drop-down menu, and you’re all set! Regroup all your data together in your ecommerce reports, not just Google Analytics! Automate your Ecommerce reporting process with DashThis! We provide a preset ecommerce report template to help you save a lot of time, but that doesn’t mean you can’t customize your template. After all, these are your results, and we want you to be able to present them the way you want to. Explore our Ecommerce Reporting Tool! Need to add other data than what’s in your connected ecommerce platforms? With our CSV file manager, you can include ALL your data into the same report! Add comments and insights, change the logo, make your dashboard clearer with section dividers... There are so many ways you can personalize our ecommerce report template! Give your client what they need with an ecommerce report that fits their brand with a custom URL, a custom design, or even both! No matter what kind of ecommerce report you’re creating, DashThis is here to make it easier! Gather your website’s ecommerce data in an Analytics report template that looks good and is easy to use! Track your AdWords performance in a dedicated report and gather all your paid ad data in a single place. Get an overview of your social performance with a Facebook report that includes both your Facebook Insights and Facebook ads data. Find out if your mailing strategy is paying off by gathering your MailChimp data in a dedicated report! Combine your Instagram and Instagram Ads data in a dedicated report to see how well your strategy is performing. Does your Twitter strategy have an impact on your ecommerce performance? Figure it out with a Twitter report. SEM reporting can seem pretty complex, so this is why we’ve created a SEM report template that’s bound to save your life… or at least, a lot of time! Gather all your clients’ website data in a single, nice-looking Google Analytics report for your client and start reporting in no time!